I love you Mom. I still can’t believe your life is now only “in loving memory of” and that you have dates on the other side of the “dash.” I tried to honor you with words from the heart on your day, but I could never ever say enough of all you had meant to us and of all you have left behind in our hearts. You were greatly loved by your family and many friends. It now has been only 7 months since your passing. Life has a way of continuing on, like a river, flowing ever so strongly day after day. In the midst of this flow, parts or memories of you come to us. Shopping is one of those occasions where I am reminded of you. I see so many things you would have loved. Reading will always be a special bond we share, especially when I read the books you have given me or read the books I know you too would have enjoyed. It has been hard. I’m not going to sugar coat it. Harder at some times than other moments, but we will be okay; your family will be okay. We miss you. Each of us is different. Your passing has caused change in each of us and in our family dynamics as a whole. Some of it is not so bad. God does have a way of creating new and beautiful from the old and from the loss. Thank you for being you and for being my mom. You will forever have a special place in my heart. Good morning. Thank you all for coming today. On behalf of my family, we thank you and appreciate your presence. And we also wish to thank George Seliga and Aycock for their valued help and assistance in this whole affair and thank you to Flowers by Susan for their beautiful flowers. Our thanks go to Gary Eha as well for officiating. As a young girl, Mom loved to roller-skate, ride her bike, play hopscotch, and blow bubbles. Mom was meticulous like her father. He was a master craftsman. She also inherited her sense of humor from her father as well. Mom was super witty and would randomly during conversations come out with a real zinger that would cause everyone to burst out laughing. Her older sister, Carolyn and my Aunt Carol, protected mom in school. There was a girl who used to hang around with Aunt Carol but then had to stay back a grade in school. This girl would then pick on my mom. She went home and told her sister. The next day her sister took care of it. She literally charged at her got right in her face. The poor girl begged her not to beat her up. Problem solved! Mom loved to memorize the Scriptures to win in her Bible class. Bernie was her first high school crush, but she told me Daddy was the far better crush! I love telling the story of how my mom and dad met. Dad was working at Gloria’s Farm market in Connecticut. Mom was too in the bakery. He noticed her one day and kept coming back every day thereafter. Until, she was no longer there. It drove him crazy wondering where she went. He had to find her and find her he did. She found another job at a store. So there he went and finally got up the nerve to ask her to go “riding” after work. And that’s what they did. They drove around in his car. It was the thing to do. They were together ever since. They got married and had me. Dad traded in his motorcycle to get a family car. He worked long hours to support his family and create and grow a business, which he did very, very well. Mom was wife, mom, and homemaker and at these things she herself did very, very well. She created our family and kept our home going. She took care of all the meals and anything any one of us needed. She was involved in our schooling years. She was in the PTA and our homeroom mother. One day she even brought in our baby chicks so I could show my classmates. The only problem was, on the day she walked from our house to the school which was down a hill carrying the box with the chicks, our class was not in the school. I think we had a field trip or maybe a school function. So she came again the next day. While she was walking with the chicks they kept trying to escape from the box! Mom put much effort, thought, and creativity into all she undertook. She made the holidays and birthdays extra special. Easter was a morning all of us kids looked forward to. During the night she was sneak in our rooms and place a GIANT basket of goodies by our beds on the floor. She thought of everything! Christmas gifts would be purchased many weeks ahead of time and the morning of Christmas our living room had no walking room and looked like a decorated store display. One year I remember seeing bicycles and wrapped gifts everywhere. There was no sleeping for us kids the night before! I gained many fine things from my mom. Creativity and imagination being one of them; she had her paper dolls and later I would have my Barbie dolls. In Elementary school mom loved to play with her paper dolls. She lined them all up with their fake dresses and played and imagined she was a rich girl with an elaborate museum type house. She had so much fun and got so involved in her make believe worlds. Her focus during these times was so intense that she could not hear anyone calling for her. I too had a whole collection of dolls with their outfits and I would create interesting beautiful worlds. My brother and sister many of a time would just sit and watch me that’s how involved I too got. Writing is another creative thing we have in common. Apparently both my mom and dad were creative individuals and these are the genes I inherited. Writing started to blossom for my mom later in her life just like it has for me. She would write poems. I will read you one she wrote me in 1994 in response to something her and I were talking about. Guard your heart, very wise words. Don’t lose yourself, like the caged in birds. When you have known no better way. Guard your heart, or you will pay. So guard your heart and live happy today. They will know, they saw it too. Or cut it with your pair of scizzor’s. It’s just not worth getting the quiver’s. Remember it’s what you say. 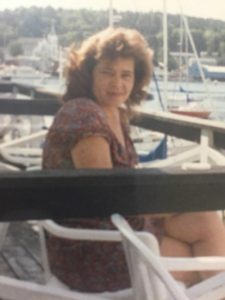 Written for Georgette: By Joanna Kijewski, Mother. Reading, Learning and education were other things mom and I shared. Books, actually piles of books are in both of our homes, along with our library and book shelves. When we went to the book store for a book, we always walked out with more than one. Mom passed on her love of reading and reading is one of the greatest joys of my life. Mom was a teacher really, Dad too for that matter. And guess what I became? I remember when Dunkin Donuts came out with their cookies for the first time; their giant cookies! We would all make runs to Dunkin to get them and when I got my license for the first time, I gladly offered to go pick them. 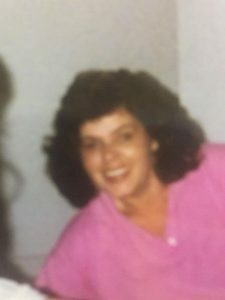 Mom had her various phases with different types of snacks, of which we all gladly enjoyed with her; mixed nuts with M & M’s, Friendly’s peanut butter sundae’s, or a freshly baked Duncan Hines cake mix. I want you all to know, I am proud to be my mother’s daughter. Mom, I want you to know how proud I am of you. You endured and handled much adversity in life and faced many challenges. 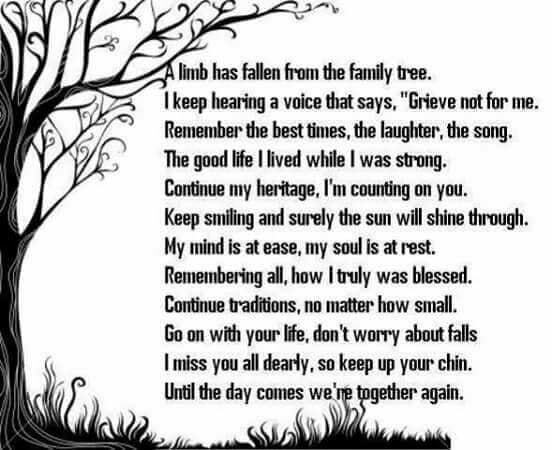 You preserved, created a beautiful home and family. You may have been shy, but not when it came to your kids. You then became a tiger. Later in life, that tiger within you began to grow as you learned more truth about yourself and what you are truly capable of. And you know what? I’m thinking you done good too as a parent and a mom. I’m thinking all of us kids came out okay. Yeah, I’m thinking I came out pretty good thanks to you and to daddy. And Mom, I too appreciated the circumstances that allowed for you and I to interact more together and to learn new things about each other. I loved our own special Miami Book Fair trip tradition. I love you very much. I will miss you. I know you are okay and with our Lord Jesus. Thank you for my life, thank you for all you have taught me by your words and by your deeds. You will always be here with me, for I am who I am partly to you. Thank you. I love you. Family; dad, Charlene, Joey, Rachel, Aunts, Uncles, and Cousins; Mom’s passing changes everything. We shall all miss her and grieve this loss. I am hoping we rise up from this time together, stronger and closer than ever as a family. May we gain new perspective for each other and appreciate each other in even greater ways in the days and years ahead.